Mueller filing in U.S. District Court for D.C.
Key quote from the 41-page filing: "Manafort's conduct ... raises serious concerns about his trustworthiness that warrant denial of the motion to release Manafort from home confinement." The backstory, via AP: Prosecutors for the special counsel argued that the former Trump campaign chairman is attempting "to mount a public relations campaign to defend himself while under house arrest." Mueller discovered Manafort "was heavily involved in the drafting of an opinion piece about his involvement in Ukrainian politics. ... Mueller's office had accused Manafort of ghostwriting the op-ed with a colleague who they said had ties to Russian intelligence." The response: "Manafort's attorneys had argued that Manafort had only edited the piece after receiving it from a former Ukrainian public official whom he knew through his consulting work in Ukraine. They also said Manafort hadn't violated the judge's order and was exercising his free speech rights to defend himself." 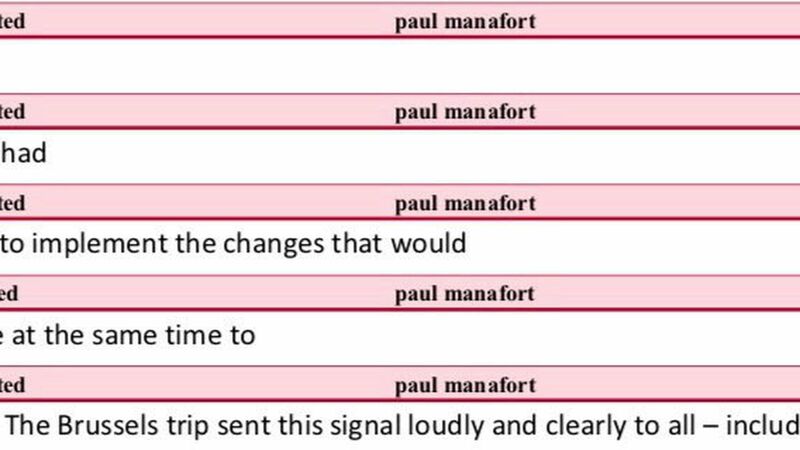 But now — with the filing of page after page of "Track Changes" notations from a document that was "Last saved by paul manafort" — "prosecutors revealed that they knew nearly every detail of that editing process." Be smart: This is a rough message by Mueller to witnesses and targets that they can be tracked and recorded even when they don't realize it. Every signal Mueller sends — with his early-morning raid on Manafort, his hires of Enron and Mafia prosecutors, and his quick flips — is that he is playing ruthlessly. "In some ways, the Russian outreach to Ms. Hicks undercuts the idea that the Russian government had established deep ties to the Trump campaign before the election. If it had, Russian officials might have found a better entrée to the White House than unprompted emails to Ms. Hicks."